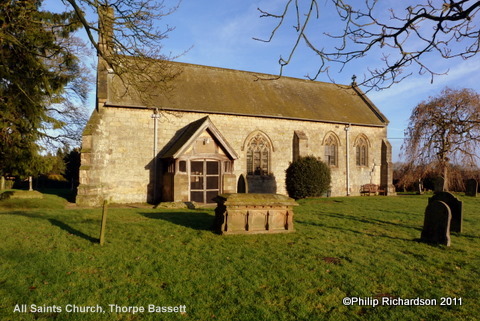 Dating from the 12th century this small village church was extensively restored in 1878-80. The 12th century doorway with chevron-moulded round arch remains and the north wall contains elements of medieval headstones and cross slabs. There is an early plain tub font and 14th century effigy of a priest reclining on a tomb chest under an arched niche in the chancel north wall. The chancel paving provides a good example of copied medieval tiles which are simply impressed with a linear motif.